When you are looking for a revolutionary offering for your workplace, look no further than a Refreshing Options 2 Go Micro Market. This offers your staff high-quality, deli-fresh food options, coffee shop-style drinks, and more than 200 confectionery, crisp, drink, and meal solutions to choose from. 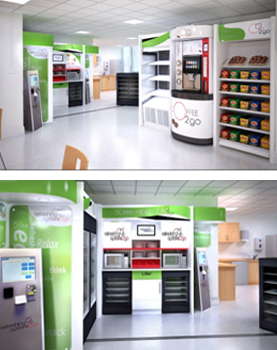 The Micro Market can be adapted to suit almost any location and workforce to meet both you and your staff’s needs. Monitored 24/7 via CCTV equipment, the application is intelligently managed by the Refreshing Options 2 Go team, who regularly replenish stock to keep everything fresh. With more and more companies moving to satellite business parks and also flexible shift or work patterns, this often limits the options that you, an employer, can offer. Employees are either limited to a catering facility with restricted facility or a backup vending machine for out-of-hour workers that offers more simple options. The Refreshing Options 2 Go solution is an award-winning, revolutionary food concept that offers fresh, chilled, and frozen products, which can be consumed on site or at home. There is no need to employ any staff to operate this facility. Call us on 01782 629 888 to learn more about different options on vending machines. You can also email mail@refreshing-options.co.uk.